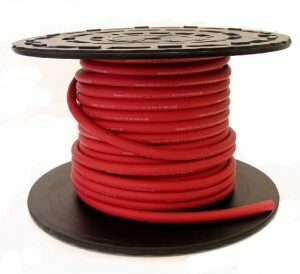 Our General Service Air Hose is a versatile USA-made EPDM rubber air hose with an abrasion resistant tough cover and kink-resistant tube. 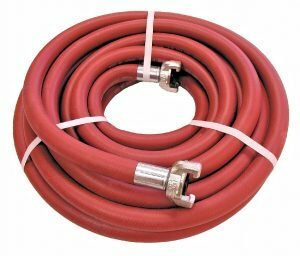 This high-grade hose is rated for general air and water service at 300 PSI from 1/4 through 1″ ID, 200 PSI up to 2″ diameter. We offer a broad range of stock sizes on bulk reels or cut and assembled in a variety of end configurations. The EPDM rubber tube and cover is ozone resistant, flexible in cold climates, and can also handle oil-misted compressed air. A highly versatile and cost effective hose option for pneumatic tool and jackhammer service. Superior tested ozone resistance when compared to imported economy hoses. 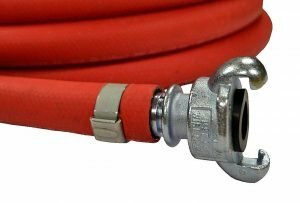 1502 Series air hose can also be assembled with brass garden hose thread couplings to make a highly durable water hose assembly capable of hot water service. See our page for Jackhammer hose assemblies, which are available in 300 PSI with crimped universal coupling (shown above) or 200 PSI with band clamped universal coupling (shown to the left).